The German artillery battery of Longues-sur-Mer is located west of Arromanches. 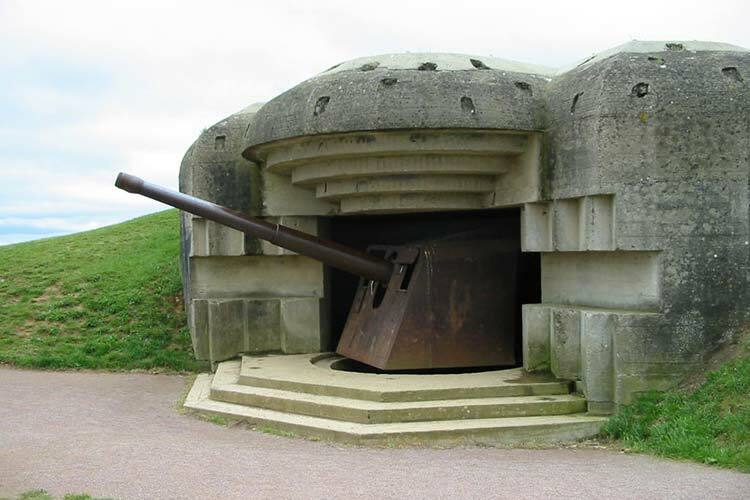 It is the only coastal battery from D-Day that still has some of its guns in place. The artillery battery was built near a cliff that overlooks the English Channel. When it was operational, the battery consisted of a fortified observation post built on the edge of the cliff. German officers in the observation post communicated via under ground telephone wires to German artillerymen manning four, fortified gun batteries. These gun batteries were located about half a mile back from the cliff edge, and each housed a 155 milimeter cannon. These cannons could fire down onto ships that would be located off of Gold Beach at Arromanches. The plan the allies drew up for D-Day called for the battery of Longue-sur-Mer to be taken out from the rear by the British 50th Division. However, things didn’t go as planned. Early on D-Day morning, the battery of Longues-sur-Mer engaged in a artillery battle with the British Battleship HMS Ajax, which was located about seven miles off shore. About 20 minutes after the artillery fire began, the German artillerymen manning two of the guns left their posts because the Ajax had scored direct hits on their gun emplacements. These emplacements were heavily fortified so they were not destroyed, but the explosions from the shells were powerful enough to force the men to flee. One of the two remaining gun emplacements took a direct hit from a shell from the HMS Ajax. This shell passed through the opening of the emplacement while the German artillerymen were loading the cannon and blew it to pieces. The explosion and fire also blew up the cannon’s ammunion that was stored within the emplacement. Today, you can see huge pieces of the the fortified roof of this emplacement laying on the ground. The accuracy of the HMS Ajax’s fire was made possible by British Intelligence that had obtained the exact coordinates of the battery of Longues-sur-Mer from a son of the farmer that owned the land upon whcih it was built. So goes the fortune of war.